Many people search for innovative and cool smartphones which is powerful, feature packed enough for normal use and want some extra features to amaze everyone, here’s another phone to put yourself into the spotlight no matter where you are and luckily now its available in India at a quite good pricetag of 39,990 INR, which is no way a waste for smartphone lovers. 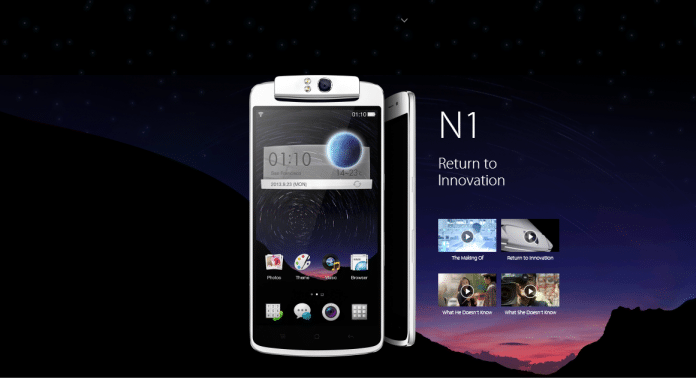 The Chinese mobile handset manufacturer Oppo has come up with their new smartphone, N1 which is the world’s first Android smartphone with moving camera. The camera is not the only thing that’s special, it is quite powerful and feature packed with 1.7 GHz Qualcomm Snapdragon 600 quadcore processor and Adreno 320 GPU to fulfill your gaming and multitasking supported by 2GB RAM. 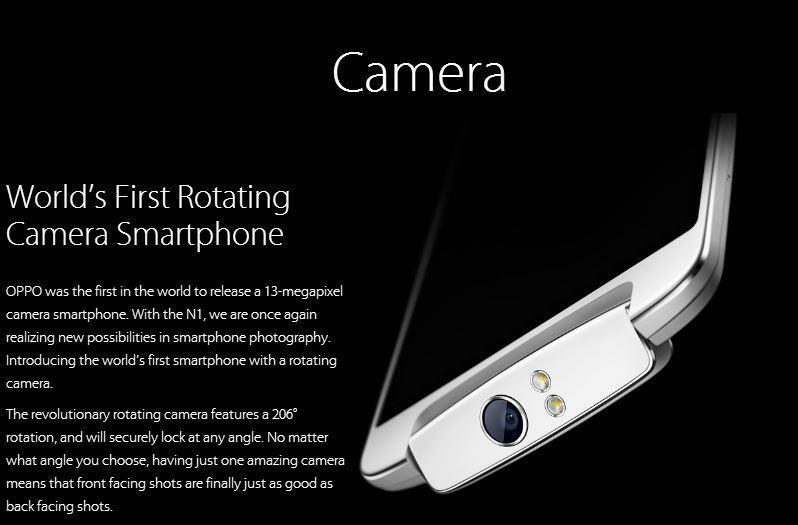 It’s 13-megapixel camera with dedicated ISP along with dual mode LED flash makes it capable of shooting extraordinary images and it is also the first Android smartphone to use six physical lenses, giving you a clearer image while eliminating any distortion. The latest generation stacked CMOS sensor, upgraded type 1/3.06 imaging module and f/2.0 wide aperture lets more light in, so you can take great photos even in dark environments. It can capture 1080p Full HD videos (1920 x 1080 pixels). The phone’s display is quite comfortable and durable with Gorilla Glass 3 IPS and 377 ppi pixel density. It is available in two onboard memory options: 16/32 GB which is enough for storing a lot of pictures, videos, documents and everything you want. 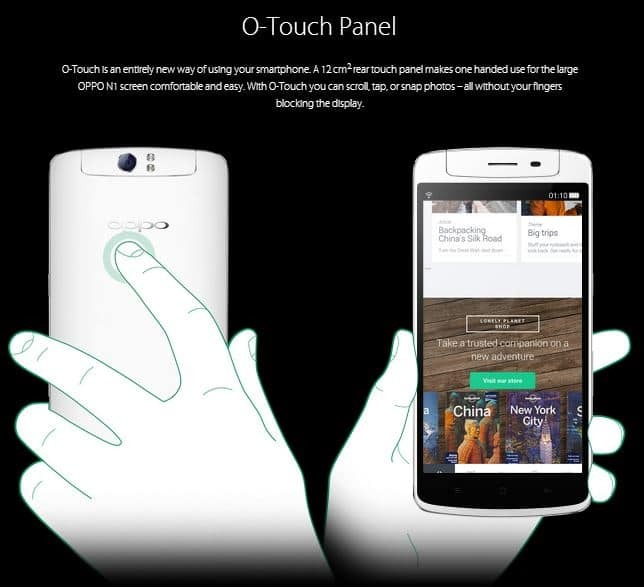 With this phone you also get an O-Click Bluetooth Remote Control to control some functions of your phone and O-Touch is an entirely new way of using your smartphone,a rear touch panel makes one handed use for the large OPPO N1 screen comfortable and easy. With O-Touch you can scroll, tap, or snap photos without your fingers blocking the display. And the best part, you can decide when you boot your phone for the first time whether you wanna use Android 4.2 or the most popular custom ROM in the world- Cynogen Mod, that’s one of the coolest idea and this is the fisrt phone in this case also which provides such a geat option.